While your puppy has been in our home, here at Pumaridge, we have gone to great lengths to ensure his or her health and social development. After your puppy leaves us, we no longer have control of the environment or conditions in which they will be living. We care deeply for this little life and we want to be of service to you for the life of your dog. It is our hope that we can bring you information which will help you in many different areas. Always feel free to get back in touch with us; we look forward to hearing how our little ones are doing and always enjoy your photos! Please keep your contact information up to date in case we want to send you any educational or health information in the future. Also add us pumaridge@yahoo.com to your address book so our emails don't go to your spam. 1. 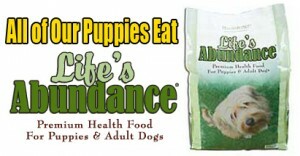 Order your Life's Abundance Holistic Premium All Life Stage Dog Food www.lifesabundance.com/holisticpooch or get another Natural NON-LARGE BREED PUPPY FOOD. I have found that using a Large- Breed formula accelerates the growth process abnormally sometimes causing a painful condition called Panosteitis. In order to guarantee the best possible health of your new puppy I as your Breeder recommend that you continue with Life's Abundance. They have a great Puppy Pack to get you started with everything you'll need to get your new baby started out right. Healthy Start Pack for Dogs-Small ((GreenBag))**The reason for the Small Size pack is that you will get a sampling of the treats, a full size Ear Cleaner, full size Shampoo and full size Bath Mist. You don't need a bigger size Life's Abundance Supplement since this is only going to be used in case of an emergency if you run out of your NuVet. I am sending home some Life's Abundance dog food as well so the 8 lb. bag that comes with the Puppy Pak is plenty to last you about a month.If you go into Petsmart or where ever it will end up costing you way more for the exact same items. 2. If you are traveling more than 2-3 hours back home with your new pup. I highly suggest you put your pup on Colloidal Silver @100ppm for 5-7 days. Colloidal Silver is a Natural Anti-Viral, Anti-Biotic, and Anti-Fungal. It will help to protect the pups Immune system from the stress of the long journey as well as any changes in its external environment. You can get this at any Health Food store or buy it from me when you pick up your baby. I sell it for $15.00 for a 4oz bottle. You may still need water for puppy for the trip home and a leash and collar for potential potty stops. Also a towel for potty accidents. Newspaper for them to use to potty on INSTEAD of going on the ground where other dogs may have gone. Also a plastic grocery size bag for waste and soiled items. Also a toy or a little bit of kibble or a bone for them to chew on if its a really long drive.